hearty root vegetables are one of the best features of these temperature-plunging months. beets, potatoes, turnips, parsnips, celeriac… the list of ground-dwellers is never-ending and these veggies just beg to be roasted and smothered in earthy chevre. 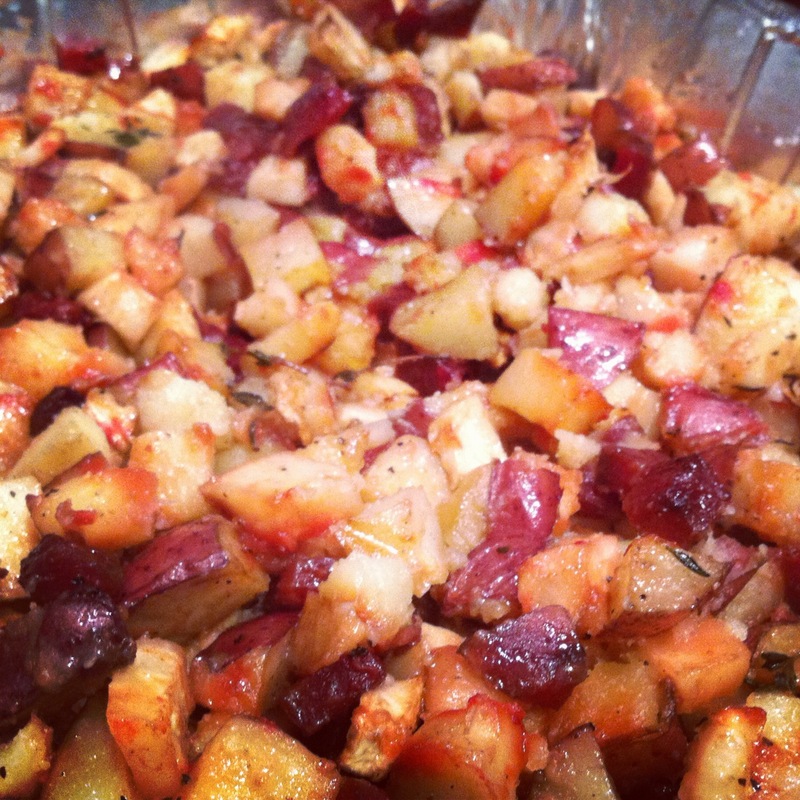 this recipe uses red potatoes, beets & celeriac, all diced into small pieces and roasted until crisp and soft. find celeriac at your farmers market right now or in the root section of your grocery. Preheat the oven to 400 degrees. Dice the vegetables into small pieces. I left the red potato skins on but peeled the beets and celeriac. 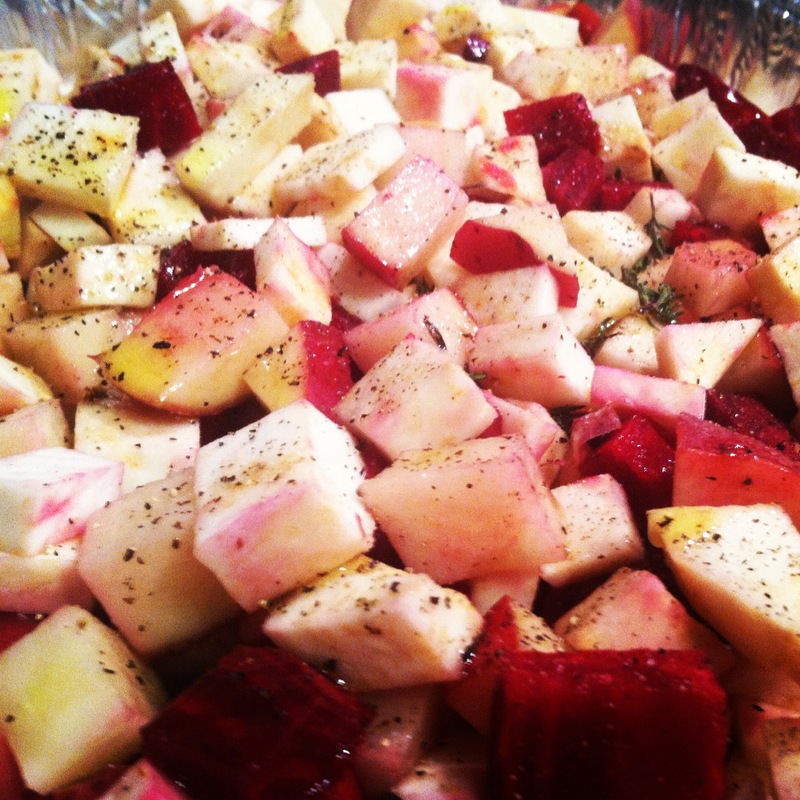 Layer them into a roasting pan and drizzle with olive oil and salt & pepper. Separate the thyme leaves from their stems and season the mixture with the thyme. 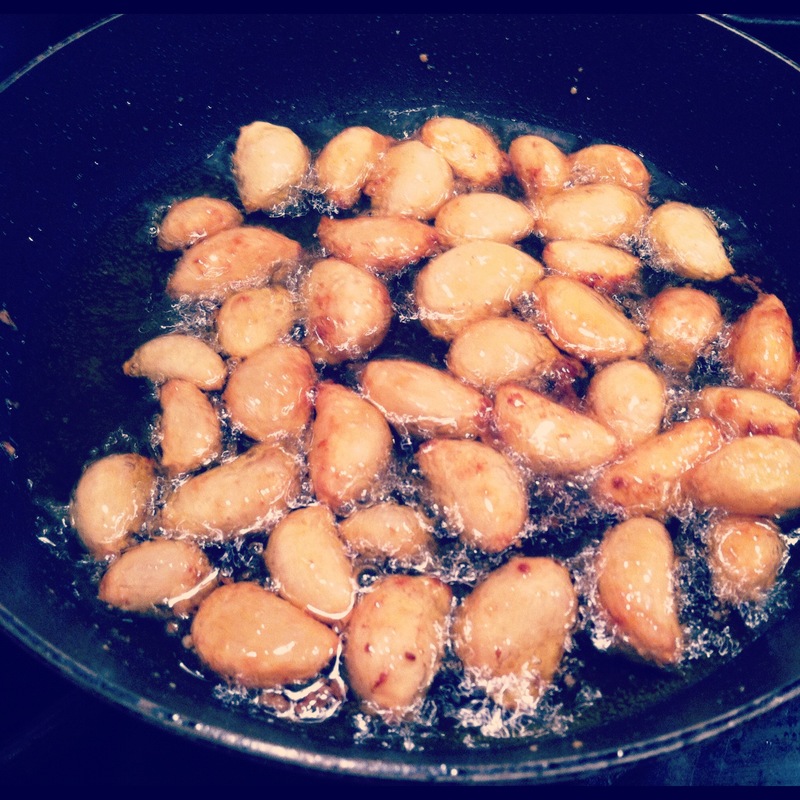 Roast in the hot oven for 30-45 minutes, until the outsides are golden and crispy and the insides are soft. The best way to estimate this point of done-ness is by trying the veggies, spoonful by spoonful, until you have depleted the roasting pan by one serving size and they taste done. To “confit” something is to cook it in it’s own fat. 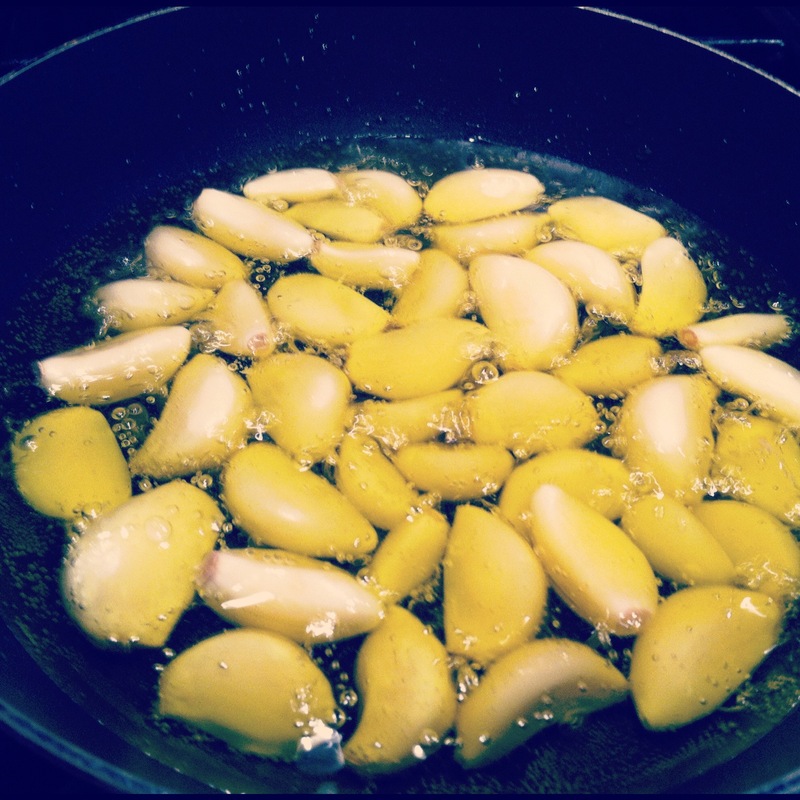 However, garlic doesn’t have fat, so garlic confit is really just a nice way of saying “olive oil poached garlic.” While the vegetables are roasting, fill a small saucepan with 1/3 inch of olive oil. Heat over medium heat and add your twenty cloves of garlic and let simmer for 10-15 minutes, until garlic is golden brown and super soft. 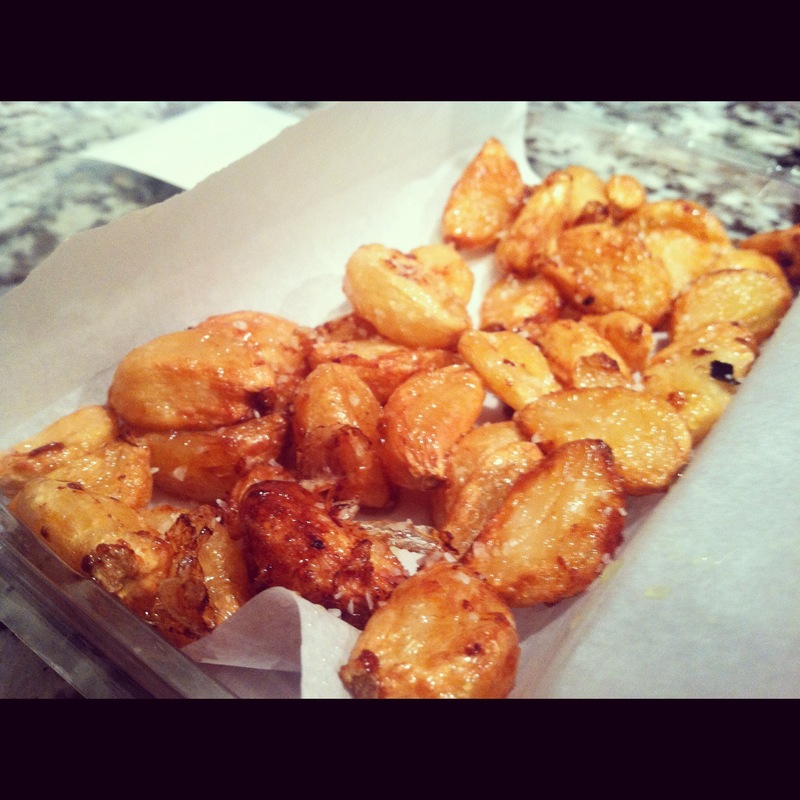 Spoon the garlic cloves onto parchment paper and try to resist the urge to snack on them. In a separate bowl, combine your chevre & sour cream. If you happen to have a grill on, you could char your scallions on that. I just popped them under the broiler until they turned. Dice up the scallion and add to your chevre mixture. Once the veggies are finished, top with the burnt scallion chevre and the garlic confit.